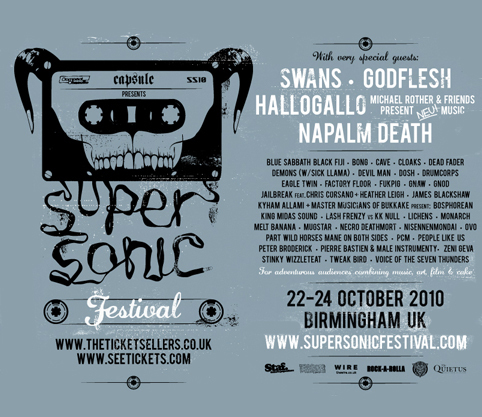 We are buzzing at the prospect of working with Capsule at the Supersonic festival, which will be landing in Birmingham in a mere two weeks’ time and getting Digbeth’s warehouses vibrating with walls of sound. If you haven’t already booked tickets for the festival then you are a fool as they are soon to sell out and you would miss out on a spectacular weekend of incredible art, mind bending sonic experiences, workshops (including pom pom shaking and Noise Box making) and a frankly awesome lineup of music including Swans, Chrome Hoof, Factory Floor (Laura’s current favourites), Melt Banana, 8-bit DJ sets (and karaoke?) and so much other stuff. And tea and cake. Of course. Jenny and Lisa from Capsule have pulled together some fantastic special events working in partnership with other arts organisations based in Eastside. We are particularly excited about GOTTESRAUSCHEN (GOD’S WHITE NOISE) at Eastside Projects and the Project Pigeon flyover on Saturday afternoon. Fierce are bringing Action Hero (part of our Caravan of Artists working towards the festival in 2011) to Supersonic festival to show Smoke and Lights: a solo sound encounter for music lovers. Visit Action Hero’s black hole, a solo experience for festival-goers who want to re-live Supersonic’s greatest adventures in sound. along with tracks supplied by this year’s line up. Select your track and step into the sound booth. Begin an auditory assault or an acoustic ramble through Supersonic yesteryear and future sounds. Remember a performance past, imagine you were there, listen in anticipation of the gig you’ll see later, play the front man. through recordings and imagining this how this year’s will sound. Action Hero are artists based in Bristol making performance and live-art.